Some of Danzeisen Dairy's products on the shelves at your local store. Danzeisen Dairy is an old fashioned yet revolutionary local dairy farm. Products sold at Bashas, Albertsons, Fry’s, Safeway, Sprouts, Whole Foods Market, AJ’s Fine Foods and the Food Conspiracy Co-op. Price range: $3.99-$4.49, plus $2 refundable deposit for the glass bottles–rinse and return the bottles to the store to get your deposit back. Milk: whole, 1 percent, 2 percent, skim, chocolate, strawberry. Cold brew coffee, Arizona orange, root beer and (seasonally) eggnog, heavy cream, half and half and butter seasoning. When people ask Kevin Danzeisen how he ended up in the dairy business, his response is that he's just a cow guy, and always has been. So was his grandfather. Danzeisen suspects that his youngest son (he has two boys and a girl) might grow up to be a cow guy, too. All of his children are animal people, but, as he can point out based on personal experience, there's a big difference between taking care of animals and being the fearless leader of a dairy herd. 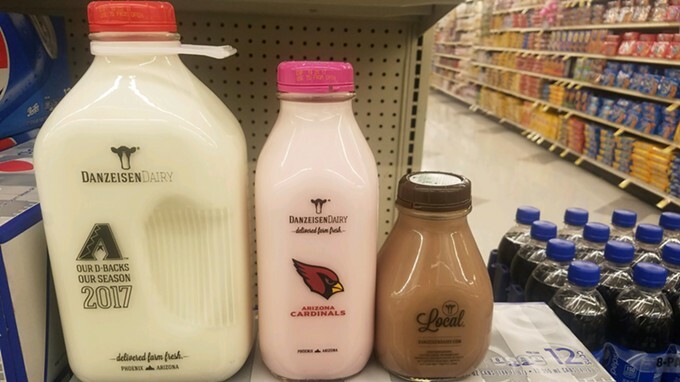 Danzeisen is the owner of Danzeisen Dairy, which is based in Laveen (just outside of Phoenix) and provides milk for cities and towns throughout Arizona, including Tucson. In a process that is all-at-once old fashioned and revolutionary, milk produced at the dairy is processed right down the road at the Danzeisen creamery, where it's put into glass bottles that look like they're straight out of the 1950s. The glass bottles are more expensive, but Danzeisen feels that plastic affects the taste of milk. Plus, the bottles can be returned to stores, where they're picked up by the dairy, sanitized and reused. Kevin said that to him, milk in plastic bottles didn't taste the way it should. The difference in taste between glass and plastic bottled milk was so big that he decided to take a chance. The machinery used to process the milk is even more vintage. Danzeisen searched the country for pieces from the 1930s (a cream separator) through '60s (a bottle washer), and uses modern technology on the old equipment to keep it running efficiently. And one more thing: All of the cows on his dairy wear stylish anklets that double as pedometers, so that Danzeisen and his employees can track every step the cows take. If they're taking fewer steps than average, they either see a vet or are looked at by someone like George Torres, the dairy manager and certified cow guy. Oftentimes, the problem is nothing more than a pebble stuck in a hoof, but tracking the cows' steps helps to nip any potential problems in the bud. "My favorite part is seeing cows getting up and eating, and just being happy cows," George says. "These girls can just do whatever and roam around and do whatever they want." Danzeisen's grandfather, Neil Viss, is the original owner in the dairy. After working as a hoof trimmer throughout California, he saw opportunity in Phoenix to fulfill his dream of running his own operation. He and his wife Gertrude started renting the dairy back in 1959. Danzeisen comes from a big family—his mom is the oldest of nine kids—and the whole gang used to head out to grandpa's farm for Christmas. "How do you not fall in love with Arizona?" Danzeisen says. "Plus, he had the cows?" Danzeisen's "fuhgettaboutit" shrug said it all: He was hooked from the beginning. "All I did was learn about cows from the time I was 16 until now, really," he said. He was so struck with cow fever (not to be confused with mad cow disease), that his parents purchased him some calves to take care of when he was a kid. Danzeisen went on to work at dairies throughout California and study animal science at California State University, Fresno. In 2002, he and his dad bought the dairy farm from his grandmother and changed the name from Neil Viss Dairies to Danzeisen Dairy. A lot has changed since Danzeisen's grandfather was running the dairy, he says, but the love for the work, for the cows and for the people has remained the same. Technology has just made it easier to do what has always been the motto: "You take care of the cows, and the cows take care of you." "We literally keep track of every single step they take," Danzeisen says. "My grandpa didn't have that." His grandpa also couldn't leave the dairy. What if a piece of equipment broke? What if they ran out of a certain type of feed? Danzeisen, on the other hand, was once in Germany looking at tractors, and when a dairy employee called to tell him they ran out of some feed. Danzeisen ordered new feed and fixed the problem in 10 minutes using his smart phone. He can also use his phone to control a system of fans and misters to keep the cows cool, but he doesn't usually have to: They're set to automatically turn on when temperatures hit a certain level. "Technology helps us to take care of the cows better," he says. 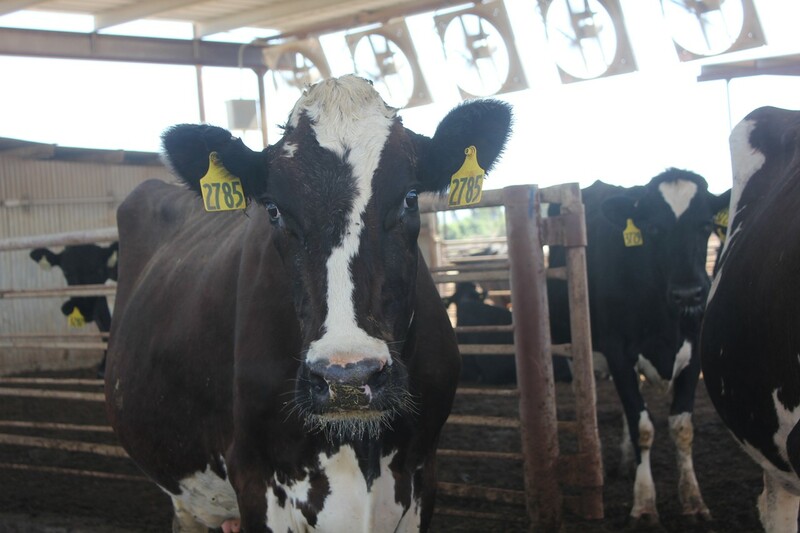 "What we know nutritionally now, we have more healthy cows now than what we ever had." Both then and now, it's an operation driven by love, and not just from Danzeisen. 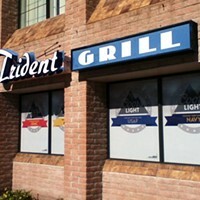 The employees are like a tight-knit family, and some of them are actually family. George Torres, the dairy manager, has spent his life in the dairy business. His wife of 27 years, Elida, works at the front desk at the creamery. She passes on stories she's heard about how an eager 3-year-old George used to go down a line of cows attaching milking apparatus like an old pro. When they were first married and sat down to talk about their goals, George said he wanted to be a dairy manager. "That was kind of like my all-time life goal," he says. "I really love and enjoy it." Danzeisen said that in a recent employee review, 98 percent of their employees said they thought Danzeisen Dairy would be either a national or international milk company in 20 years. He's proud that they believe in both their product and their team. "They're really great people to work for," Elida says. Kevin left the dairy early for the day, to go buy his daughter a puppy for her birthday before catching the ASU football game. Jeff Memmelaar, in charge of sales, said he was gearing up for Friday: his daughter and Kevin's daughter were having a joint birthday party, and a gaggle of 10-year-old girls would be having a sleepover at his house. It's an eco-friendly, milk-loving, meticulous family, and 2,000 of the members just happen to be cows.